Startup India, Stand up India is new slogan coined by Prime Minister Narendra Modi. A Startup is a small company that is just started. Startup companies are initially funded and operated by founder or individuals. Startup companies usually offer new product or service that is not available in the market. Are you planning to launch Startup? Are you looking for business partner in your startup? Why don’t you convert beautiful relation of husband and wife into the business partnership? The argument supporting this idea is given below. Husband and wife relation is chosen by us whereas all other relations are of not our choice. We fall in this relation as we have good understanding between each other and same is required for running a successful business. 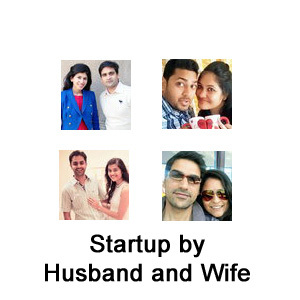 You might be surprised to note that there are many successful startups in India that are managed by Husband and wife. Let’s explore the detail of the same. Rohan and Swati met each other in London school of business and they get married in 2009. Swati was working in Goldman Sachs and Rohan was also working in good Multinational Company in the UK. After working for few years, they returned to India. In 2013, they decided to launch startup CashKaro an online e-commerce portal. Cashkaro offers a discount coupon for online shopping. You can use this discount coupon to purchase different products and save money. The main objective behind cashkaro is to get you a maximum discount while doing online shopping. Anand and Mahek met each other in the year 2008 during internship of GlaxoSmithKline. They got married after 4 years. They decided to launch own startup Wedmegood in 2014. Wedmegood is one wedding portal. This portal is helping hand and guide during your wedding. This portal will organize everything for your wedding like photographers, makeup artist, organizer, catering, decoration experts etc. This startup works on fixed fees model. This startup is running successfully and earning a good amount of revenue in one year. Abhinav and Radhika Khandelwal got married with each other in 2011. After marriage, they have gone to Switzerland for few months. During their visit to Switzerland, they realize scarcity of Indian sweets. They could not get sweet of Indian taste in Switzerland and they decided to launch online sweet portal. They launched SweetsInbox startup. Sweetsinbox is online portal selling sweets online operates in 10 cities. Atit and Madhulika first met in Oct 2012, when they were working with technology startup firm called as “Applied mobile labs”. Madhulika is fond of food and Atit is fond of movies. They became close to each other from food and movies. They decided to leave the job and start own Startup in 2014. This is how Gigstart has born. Gigstart brings entertainer, comedians, singers, dancers, artiest, entertainer together. If you are looking for any artist, you can get it online at Gigstart. Revenue of Gigstart is on the commission basis. Oldest startup on the list is Chumbak. Chumbak is Bangalore based lifestyle product Startup founded by couple Vivek and Subhra in 2010 by selling their house in 45 Lakh. Chumbak offers extraordinary designed personalized products, including apparel, bags, wallets, souvenirs, key chains, bracelet, and footwear. Chumbak has 20 stores and kiosk across 5 cities. Chumbak is earning very good amount of revenue. Pranay and Tina married couple is managing different startup. Pranay is the founder of Quikr online classified portal. Tina is running another Startup Waltzz. Waltzz is online matchmaking and dating app. This married couple is giving healthy competition to each other by working on different startups. So, what are you waiting for select your business idea and launch your Startup along with your life partner. If we are missing anyone is list let us know by submitting your comments! Really Inspiring but I find pair of friends more inspiring such as Flipkart, Taxiforsure etc.